Hayleys Energy Services (HES), yesterday ushered in the first floating production storage and offloading (FPSO) asset to ever call Sri Lanka, in collaboration with the Hambantota International Port Group (HIPG). The FPSO asset, Dhirubhai-1, is expected to be docked at the Hambantota International Port for a minimum of six months for a warm lay-up. The owners of Dhirubhai-1, Aker Contracting FP ASA together with its technical manager Aker Floating Production based out of Norway, focuses on the business of owning, chartering and operating Floating, Production, Storage and Offloading (FPSO) vessels equipped for offshore Oil and Gas production. The arrival of Dhirubhai-1, marks the second vessel to call on the Port of Hambantota for lay-up services, the first being the arrival of the Oil & Gas Drillship “Aban Abraham” in December 2018 initiated by Hayleys Energy Services. Dhirubhai-1 comes out of a 10 year project, where it was operating at a depth of 1200m off the East Coast of India. 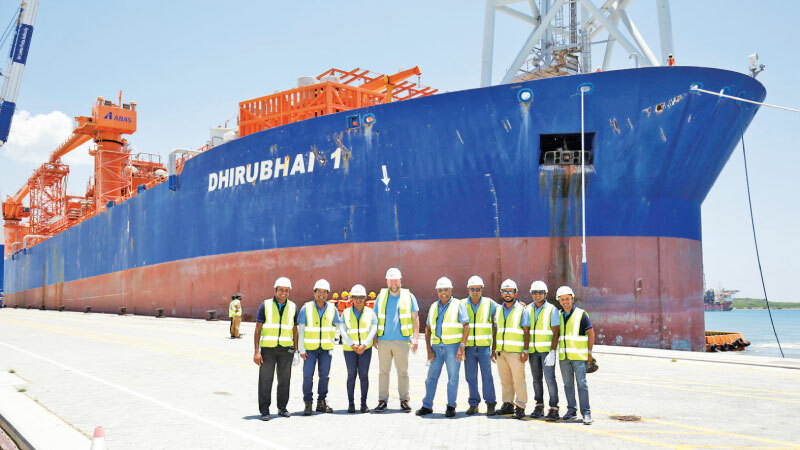 Given the proximity advantage of bringing this vessel for lay-up services at the Hambantota International Port, HES took initiative in persuading the owners, Aker Floating Production. In light of the continuing lay-up service projects coming into the Port of Hambantota, Hayleys Energy Services has even set up a permanent office within the Port, on the 6th Floor of the Sayurupaya Building, Hambantota International Port, the first by an Oil & Gas Services company at this port.